Zimmer Patient Specific Instruments simplify the total knee process from start to finish without compromising surgical decision making, surgical technique, or intra-operative flexibility. Potential benefits include: advanced preoperative planning, more accurate implant sizing and alignment, reduced instrumentation and fewer intra-operative steps, shorter operating and tourniquet times. Based upon the clinically proven principles of mechanical axis alignment, Zimmer Patient Specific Instruments use a patient MRI scan to produce custom-made pin guides that conform precisely to the individual patient’s anatomy. 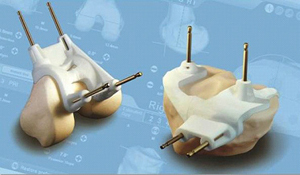 Alignment in total knee arthroplasty remains a crucial factor in the function and longevity of the joint replacement. By combining advancements in instrument technology with proven orthopaedic alignment principles, Zimmer Patient Specific Instruments help to ensure successful outcomes for surgeons and their patients. The custom pin guides are designed with position stabilising features and anatomical reference lines, including the transepicondylar, mechanical and AP axis to verify positioning, and eliminate variability in pin guide placement. Ensuring accurate pin guide placement means that surgeons and their patients can be confident that the end surgical result matches the preoperative plan.